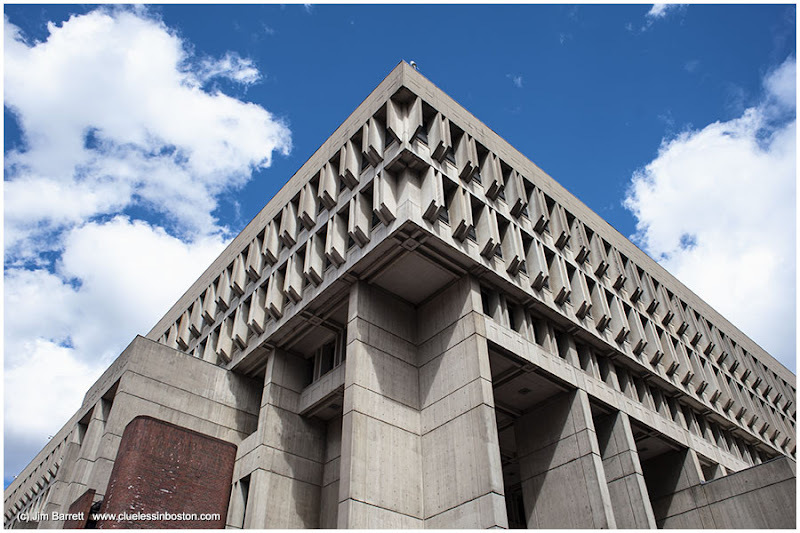 Angular view of one of Boston's most recognizable (and hideous) buildings. It certainly makes for a graphic image, wonder if it's the concrete that makes it appear so hideous (love that word)perhaps if it had been designed in a softer, warmer sandstone it would have been a whole different ballgame, do you think? Really strong shape and lines; would be a cracker in black & white. Not a fan of concrete, but from this perspective it is an interesting geometric composition. The blue sky is nice. Aaaah, Brutalism. This I do not like! It reminds me of London's National Theatre which I've never managed to like either. This is a fabulous perspective. I must be the only person alive who admires this building (at least the outside).